Instead of doing something that’s definitely unhealthy, like eating Tide pods, or something that’s downright unsafe, like wearing a blindfold as you’re driving or jumping out of your moving vehicle and dancing alongside it, a new social media challenge is going viral—and it’s inspiring people to do really good things. Take a “before” picture of any area, such as a beach, park or street, that’s filled with litter. Snap an “after” picture showing off your accomplishment and post your photos using the #Trashtag hashtag. The #Trashtag hashtag has been around for a while. According to Mashable, the challenge idea may have originated in October 2015 when the outdoor gear company UCO launched the #Trashtag Project. The goal was for people to pick up 10,000 pieces of trash in the wilderness by the following October. About three and a half years later, the #Trashtag Challenge is really taking off. It started earlier this month when Facebook user Byron Roman offered “a new #challenge for all you bored teens” that has been shared over 330,000 times. Someone then posted his challenge on Reddit, helping to increase its popularity even more. “Finally, an internet trend that is doing good that I can get behind,” Tessa Shabram of Portland, Ore., told KGW. She and her boyfriend spent an hour cleaning up trash under a bridge. Shabram brings up an important point: Trash on land often ends up in rivers and oceans. During an unusually rainy winter in California, Seal Beach looked more like a “landfill blanketed with trash,” the Orange County Register reported. Although this happened prior to the #Trashtag Challenge, fortunately some good Samaritans volunteered their time to help clean up the mess. 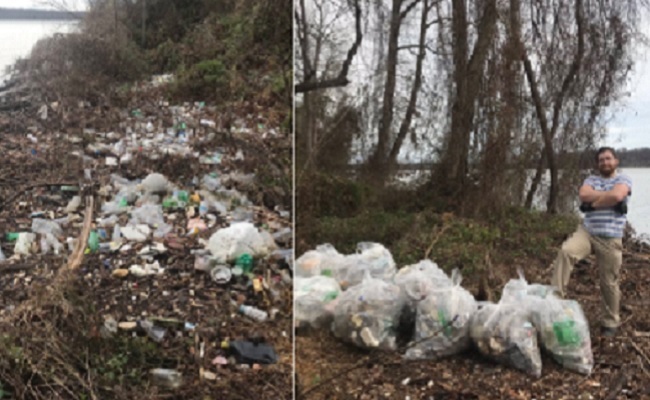 People around the world are now volunteering their time to participate in the #Trashtag Challenge. In Junagadh, India, a group cleaned up plastic and other litter, filling 10 trash bags. In Saint Petersburg, Russia, Instagram user @horses_spb posted before and after photos of their clean-up effort—from a horse’s point of view. A young man in Nepal did his part by filling up 10 trash bags. Here’s hoping the #Trashtag Challenge isn’t just a fad, and picking up litter (and not creating it in the first place) becomes a habit for participants that is much more beneficial than, say, eating laundry detergent pods. Of course, not all other social media challenges are unhealthy or dangerous. For one famous example, the Ice Bucket Challenge in 2014 raised $115 million for the ALS Association. If the #Trashtag Challenge encourages bored teens—and everybody else—around the world to make it a cleaner place, the impact will be priceless. Clever challenge... especially with all the youngsters that are showing up against Climate Change around the world. Wonderful projects! Thank you all for your efforts. You are making our world a better place and we appreciate it. You are also setting a good example. Kudos! Thanks. We do a lot of this here in Interior Alaska in Fairbanks. It really makes a difference. Thanks. This is our garbagge we are all resposible for it, the ones the litter should be made accountable.